For those of us that are carnivorous, beef is what is for dinner. For those of us that trade in the commodities futures market, cattle are a volatile commodity that offers lots of opportunities. Trading Hours: 10:05 a.m. to 2:00 PM EST. Contract Months: Feb, Apr, Jun, Aug, Oct, Dec. Tick Size: 0.00025 = $10.00 (0.00025 x 40,000 lbs). Last Trading Day: The last business day of the contract month. There are two types of cattle traded at the CME: Live cattle and feeder cattle. Live cattle grow from the calf stage to a point when they reach about 600 to 800, which takes about six to ten months. At this point, they are transferred to feedlots, with the classification as feeder cattle. They remain on the feedlots for about another five months where they gain another 500 pounds before they are processed into the beef we find at the supermarket counter. The average slaughter or processing weight is about 1,250 pounds, and a dressed carcass weight is about 750 pounds. The seven major cattle producing states in the U.S. are Arizona, California, Colorado, Iowa, Kansas, Nebraska, and Texas. Cattle are usually fed corn, milo, and even wheat if the price is low enough. Protein in their diet often comes from soybeans. Cattle also eat roughage like hay and alfalfa. Weather is a significant factor for cattle prices. Sweltering weather will cause cattle to lose their appetite, and when they do not eat, they do not gain weight. Additionally, freezing weather causes cattle to become stressed and burn more energy to stay warm; which means less weight gain. Less weight gain equals less meat and lower prices for each animal. It can also mean market shortages and higher prices as availability declines. The most important report for cattle futures is The Cattle on Feed Report. This report contains monthly data on the total number of cattle and calves on feed, placements, and marketings. Cattle on Feed is the amount of cattle placed on feedlot that will eventually arrive for processing. Placements are cattle put into a feedlot, fed to produce a grade select or better, and they are intended for the slaughter market. Marketings are cattle shipped out of feedlots to the slaughter market. Seasonally cattle prices move higher from November to January. Prices tend to move lower from February to May. The Cattle on Feed Report is usually a big price mover. Mad cow disease pops up every once and a while. An outbreak of mad cow will cause the market to sell off sharply. Sometimes there is panic selling from rumors, but if there turn out to be legitimate cases, demand and prices can drop quickly. The cost of feed - corn, soybeans, wheat, etc. can also impact cattle prices. If the feed is too high, cattle will typically be sent to market earlier, and at lower weights, this tends to lower prices for cattle futures. In 2012, feed prices rose as a drought in the United States moved corn and soybeans to all-time highs and wheat to the highest price since 2008. As feed prices increased, cattle producers sent animals for processing early, rather than paying the high prices for feed. Therefore, a short-term glut of beef occurred in the market, and prices temporarily moved lower. 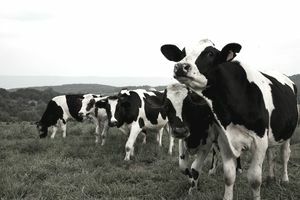 However, since the cattle population fell dramatically during that period and it takes years to raise herds, a shortage developed in the years that followed. The shortage caused live cattle prices to move to all-time highs in October 2014 when they hit $1.71975 per pound on the active month futures contract. At that time, cattle moved into a backwardation – deferred prices were lower than nearby prices a sign of market tightness or short supplies. Live cattle futures can be extremely volatile at times but the spreads between different months can be even more volatile than the nearby futures price. Just like in lean hog futures, the peak season for demand is the grilling season which starts each year at the end of May on Memorial Day and ends in September on Labor Day in the United States. As barbecues are in high gear during the summer months, demand for steaks and burgers increases. Why Are Separate World Sugar and Domestic Sugar Markets?